Damian was diagnosed at 19 months with Smith-Magenis Syndrome, after his mum realised things weren’t quite right. Damian barely slept and his development was much slower than that of children his age. Once he had his diagnosis he started therapy and my sister (his mum) and I started researching. We had no idea what Smith Magenis Syndrome was. Damian started therapies and things were looking up. Unfortunately all our worlds were rocked only 6 months later when we lost Damian’s mum, dad, an older brother and his sister in a car accident. Damian was severely injured, we are extremely lucky he is still with us. He spent 3 months in hospital and was in and out all of last year. His specialists are still amazed that he survived let alone that he is back to being a little boy again. He has suffered more emotionally and physically then most would in a lifetime but this little man is so tough, he has been through it all with that beautiful smile on his face. We have had care of Damian since August 2012 and it is challenging. Every day has challenges, our lives changed overnight. Damian is almost 4 but is still only at a developmental age of around 12-18 months. He has sleep issues, he self-harms and meltdowns come all too often. But I could not imagine our lives without him. 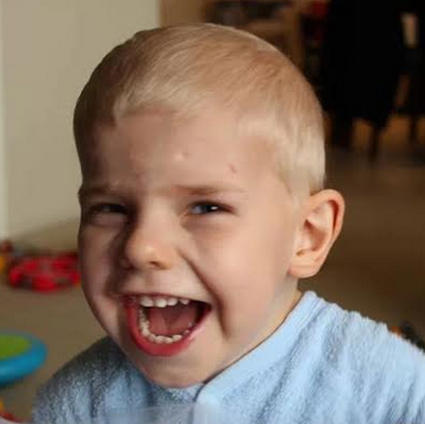 His smile lights up any room, his cuddles melt your heart and how brave he is inspires. He is one special boy.